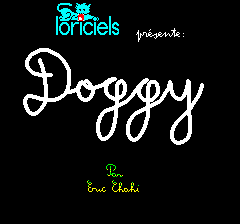 AUTHORS : Eric Chahi, music by Rémi Grouzelle. NOTES : WAV format for Euphoric, use Euphoric's virtual tape player (F1 key in Euphoric). Transfer errors: unknown, game seems to work fine. Excellent !!! I still spend hours with it. 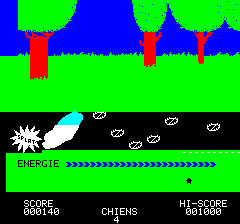 One of the best and most original game for Oric ! A must have. ahh, such a tough arcade/memory game. The running doggy animation (wow the size of that sprite!) is just so cute, (even on an amber monochrome display which is all I had at the time!). Although the difficulty level got me bored after a while..slow speed was just boring and fast was too hard! Mind you I didn't pay that much...this was my second multideck tape recorder "crack" =) Sorry Loriciels. 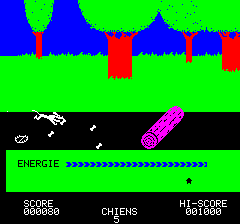 An Oric game I did not know about! And what a fantastic find it is - I just love it. 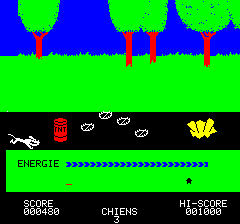 This is one of the most addictive games ever for the Oric. I played it for hours and still remember the music. Very good graphics and sound, but it becomes a little one-dimensional after a while. It is after all just a running-and-obstacles game, there isn't much more. But do not let that put you off, it is definitely a game you must try and will provide quite a few hours of fun before you get tired of it. I never got to the end, does anyone know what happens? Doggy was a good game. Nothing less, but nothing more. I can't explain why but even if, on the technical side, this program is among the very good ones for the time, this is not one of my favourites. exellent game! BUT! I want it VERY VERY VERY MUCH!!! Who knows, where I can download it????????? Thanks. Both the graphic, the scroll and the music together, makes this a perfect game for the oric. You can't help to just love this cute dog which need your help to find a safe way home. But trying many times, I haven't completed this game-yet! That game was really well made for that time. And it's funny to see that some very well known developers (Eric Chahi) have started on the Oric before doing other great games later (Heart of Darness, Out of this world, Future Wars, ...). 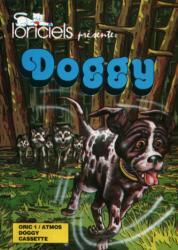 By the way, I though the name of the game was "Doggy Dog" (may be I am wrong...). But the programer's first name for sure is "Eric". Very good action game. And the best music score on Oric, ever ! I played hours and hours, level by level, on this game.